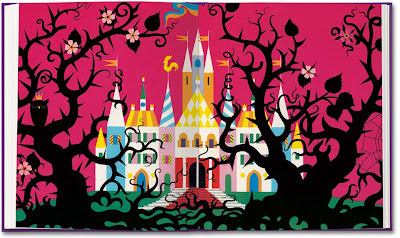 The Fairy Tales of the Brothers Grimm is released today. If you aren't familiar with its publisher, Taschen, they are a publisher of art books, sometimes even risque, often avant garde. So it's fascinating that they's gotten on the fairy tale bandwagon and published a collection of Grimms' tales with illustrations by several illustrators over the past 100+ years. I bought a copy for myself and it's quite lovely. The purple cover is cloth. 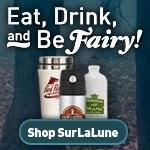 I have many of the illustrations in other books in my library--I have an extensive SurLaLune library--but some weren't represented before. My biggest disappointment is that several of the illustrations are cropped and bled on the pages. It's lovely, but I want the full images in an "art" book. I'm picky that way. 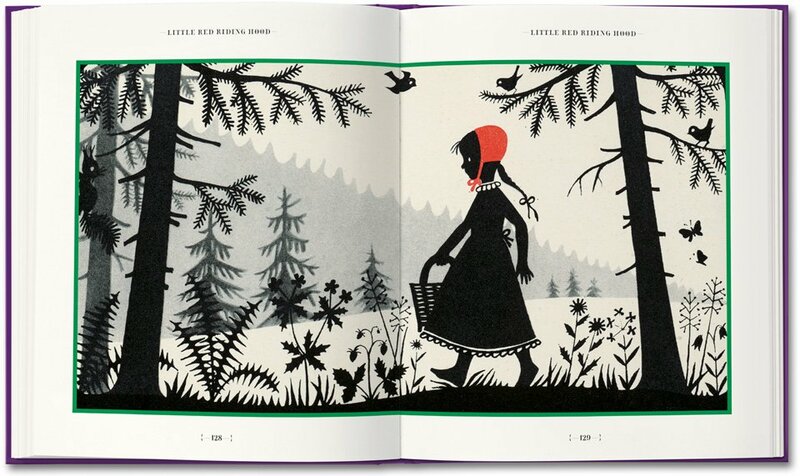 But the book is beautiful and would also make a lovely gift book. The rest of the information in this post come's from Taschen's webpage for the book. 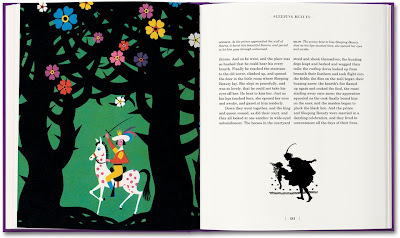 The book is available at all booksellers, including Amazon at The Fairy Tales of the Brothers Grimm , of course. 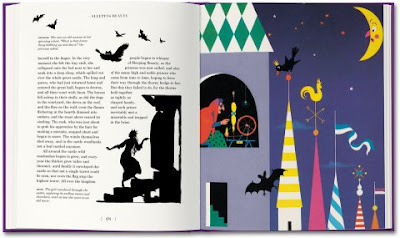 This book brings together twenty-seven of the most beloved of the famous Grimms’ fairy tales, including all the classics, such as Cinderella, Snow White, Sleeping Beauty, and Hansel and Gretel in an all-new translation specially commissioned for this publication. Containing a painstakingly-researched selection of illustrations by some of the most famous illustrators from the 1820s to the 1950s—including golden age legend Kay Nielsen, bestselling author Gustaf Tenggren, British darlings Walter Crane and Arthur Rackham, and giants of nineteenth century German illustration Gustav Süs, Heinrich Leutemann, and Viktor Paul Mohn, as well as many new discoveries—this compilation also includes beautiful silhouettes culled from original publications from the 1870s and 1920s that run throughout the entire layout. 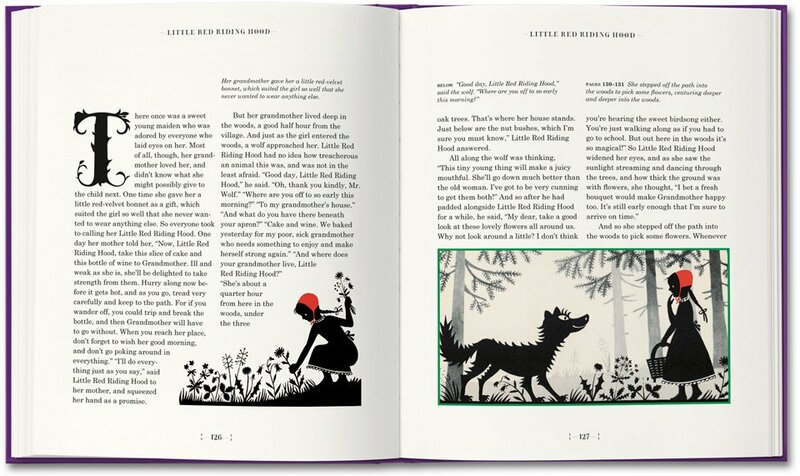 Interlaced in the book are also dozens of entirely new silhouettes designed and created especially for this book. 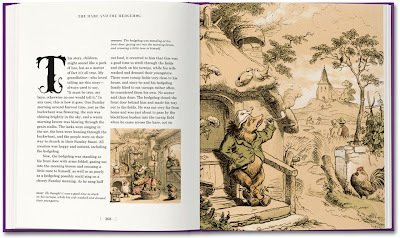 In addition to the tales, the book also includes an introduction to the Grimms' legacy, brief introductory texts for each tale, and extended artists' biographies in the appendix. For adults and children alike, this classic addition to any library brings to life the never-ending magic of the Grimms' fairy tales and their delightful illustrations. 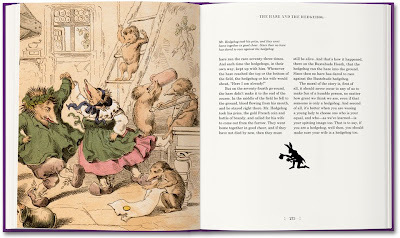 Brothers Jacob (1785–1863) and Wilhelm Grimm (1786–1859) were German academics and linguists who spent years collecting popular fairy tales and folk tales. 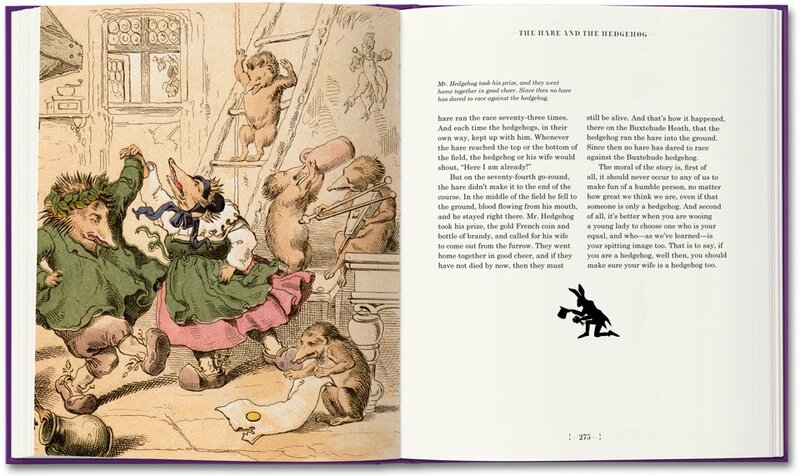 Their resulting compilation of over 200 stories Kinder- und Hausmärchen (Children's and household tales) is one of the most famous collections of tales in the world, influencing generations of writers, artists, academics, composers, filmmakers, and animators. Matthew R. Price has translated for leading theaters and publications in Germany and the US. A graduate of Princeton University, he studied in Berlin on a DAAD Fellowship, receiving his masters from the University of the Arts. After an early career producing theater, he earned an M.B.A. from Columbia University and lives in New York City. "Once upon a time I counted thousands of deutsche marks in a Dresdner Bank vault with a colleague who spoke in heavy Saxon dialect; deciphered medieval German texts in rare-books rooms; and performed Schubert lieder in places as different as Moscow and Montana. These experiences stretched and challenged me, and the German literary, theatrical, and musical culture came to exercise an unexpected grip. The Grimms occupy an iconic place in that canon, of course. Yet initially I had little sense how best to unpack these stories for today’s Englishspeaking readers—and listeners. I leaned on my training: countless hours of living with the language, and theatrical instincts I’d honed for years. In my mind I saw fantastic animated films as I worked through these stories. They were dark, complex, and arcing versions, not the Disney films associated with the material. There is no denying the unforgiving morality or the harshness of daily life one finds in the tales. But even more striking, finally, was the full range of emotion, especially the comedy and delight of the characters and their antics. I faced a balancing act between adherence to the original structure, and freedom with the abundant choices of English. I tried to use clear "camera angles" and to dose in narrative color as a sensory highlight. Noel Daniel and I disciplined ourselves to hold fast to the original, despite my urges to tread off the path into the magical woods. 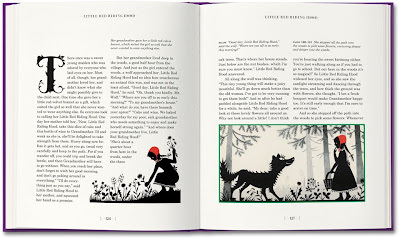 I sincerely hope readers will feel that our efforts resulted in a fresh and enjoyable translation reflecting the depth and wonder of these magnificent tales, which offer something for all ages." The editor:TASCHEN editor Noel Daniel graduated from Princeton University, and studied in Berlin on a Fulbright Scholarship. She received a master’s in London and was the director of a photography art gallery before becoming a book editor. Her TASCHEN books include Magic 1400s–1950s (2009) and The Circus 1870–1950 (2008).